ST-0136 - wood Features: -Glass optics for a clear view (not plastic lenses). -Polished brass telescope with wood cased body. 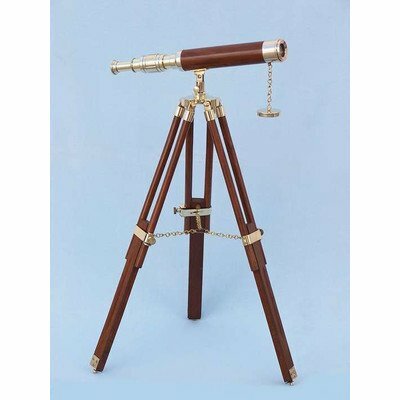 -Sturdy wooden tripod supports telescope when viewing. -15X Magnification. -Fully functional telescope focuses and magnifies. -Telescope Type: Optical tube. Color: -Gold and Brown. Dimensions: Overall Height - Top to Bottom: -30". Overall Depth - Front to Back: -14". Overall Product Weight: -7 lbs.